Greenville’s Eli Moore catches a touchdown pass during a seven-on-seven passing scrimmage on Thursday in Greenville. The Green Wave played host to Brookville, St. Henry and Twin Valley South. GREENVILLE – Even though seven-on-seven scrimmages are more like playground football than real football, Greenville coach Aaron Shaffer said, he was pleased with his team’s showing on Thursday. 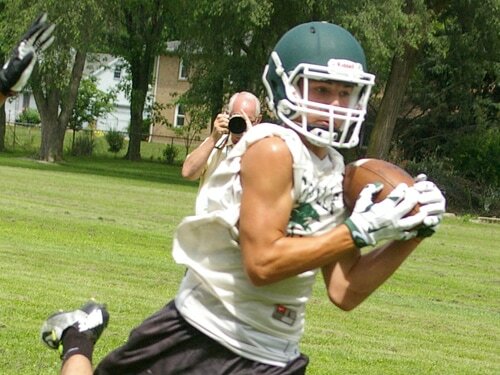 Greenville played host to Brookville, St. Henry and Twin Valley South for a seven-on-seven passing scrimmage Thursday. The teams used a round-robin format with each varsity offense and defense getting a pair of 10-play series against each opponent. In the three-hour scrimmage, Greenville’s varsity offense scored 14 touchdowns while the Green Wave varsity defense held its opponents to six touchdowns. Greenville started the day by matching up against Brookville, and the Wave scored on their sixth offensive play. The Green Wave defense then held the Blue Devils scoreless on their first possession and also intercepted a Brookville pass. Greenville then scored three times on its next offensive set against Brookville, and the Blue Devils scored once during their second possession. Greenville’s junior varsity offense threw an interception, and Brookville’s junior varsity offense scored a touchdown during a pair of six-play series. Greenville’s varsity then took on St. Henry and scored three touchdowns in both of the Wave’s 10-play series. St. Henry scored once and threw an interception during its first possession against Greenville and then scored twice during its second possession. Greenville’s junior varsity offense went scoreless against St. Henry while the Green Wave junior varsity defense picked off a pass and held St. Henry scoreless. In the final matchup of the day Greenville scored twice during its first possession against Twin Valley South. The Wave then scored again during their second possession and threw their only interception of the day on the 10th play of the second possession. Twin Valley South scored during both of its possessions before the Greenville freshmen came in for an offensive series and scored. Greenville and Twin Valley South ended the scrimmage with an extra offensive possession for each squad with Greenville’s varsity offense scoring once and the Greenville junior varsity defense allowing one score. While it was a positive day for the Green Wave, the real test will come next month when they are in full pads and have all 11 players on the field. With seven-on-seven scrimmages solely focusing on passing, Thursday did provide Greenville a good chance to see its defensive backs in action. Finding a couple new starters in the defensive backfield is one of the Wave’s top priorities this summer, Shaffer said, and he saw some good things from the athletes in contention for playing time.